The YMCA Achievers program is a national college readiness program designed to help teens Through academic support, career exploration and mentoring, the Achievers program helps teens raise their academic standards, develop a positive sense of self, build character, explore diverse college and career options, and meet and interact with professionals who serve as role models to inspire them to greater heights. Meetings times, dates, and locations are determined by school and their advisers. This summer experience gives teens ages 12-15 the opportunity to build achievement, belonging and relationships by participating in sports, team building activities, weekly field trips, arts classes, swim lessons, serving learning projects and learning science and math in a fun and interactive environment. Y Achievers Academy increases readiness for the future by teaching them skills for college and career readiness and introducing them to professionals in the community that inspire them. Check our this clip from our Summer 2018 Lemonade Day Sponsored by Williams Chicken. Check our this clip from our Summer 2018 Golf Trip with the Advocates Pro Golf Association (APGA) at TPC Craig Ranch. The YMCA Achievers program is a national college readiness program designed to help teens set and pursue high educational and career goals at no cost. Through academic support, career exploration and mentoring, the Achievers program helps teens raise their academic standards, develop a positive sense of self, build character, explore diverse college and career options, and meet and interact with professionals who serve as role models to inspire them to greater heights. Meetings times, dates, and locations are determined by school and their advisers. Y-Achievers Teen Summit is an educational enrichment and leadership development opportunity targeted toward teens in 9th - 12th grade from economically challenged communities. 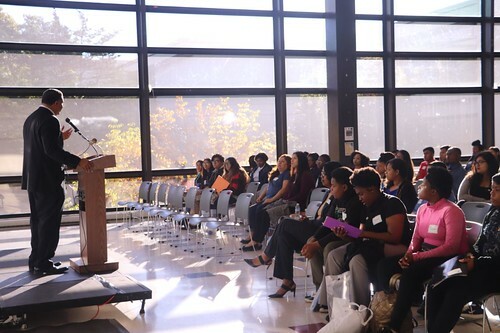 This Saturday morning summit is geared toward college readiness where teens are guided by career and college professionals on making choices for their future after high school, the basics of college life, and how to afford college. Workshops are also available to parents on how go send your child to college at little or no cost, how to let go and how to support their teen’s choices. Teens learn how to make positive choices for their immediate and long term future, as well as how to contribute to their community. Exposed to professionals from various career disciplines in interactive workshops, teens discover a variety of career fields that can be personally and professionally fulfilling. Various organizations and businesses present volunteer and job opportunities. Teens also have an opportunity to learn how to apply and interview for summer job opportunities and/or internships at professional organizations related to their field of interest.